Several weeks ago while riding on the NYC subway, I overheard a couple of religious Jewish men talking about doing a marathon on Yom Kippur. From what I could gather this was an unofficial event held in the town of Monsey, NY. I couldn’t believe my ears, but after listening to them for several minutes I began to realize that these men were talking about an actual event that was to occur sometime after the morning Yom Kippur services. Later on that day I inquired of my sister that is friendly with some people that live in the Monsey area. She was able to confirm that there is indeed a group of people that participate in a marathon as an extreme show of faith. They do this marathon without food or water in keeping with the scripture of abstaining from all sort of nourishment on this Day of Atonement. This “event” is not publicized, is completely unsupported and no records are kept. There would be no mile markers, no timers, or aid stations. Nothing that would normally accompany a normal marathon. I wondered if it was even possible to do a marathon without food or water and what the attrition rate would be for those who attempted it. I decided that this would be the kind of event that I would like to try to do. After insisting that my sister gather more information, I found out that the unofficial event would be held around Rockland Lake in Rockland Lake State Park just outside of Monsey starting at high noon. 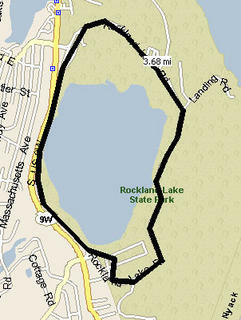 The course would be seven 3.6 mile loops around the entire lake. The late day start would allow for everyone to go to Shul in the morning and would time the race so that the finish would be close to the time when you were allowed to break fast. On this particular day, Monsey really should have been called Monsoon. The rain came pouring down from the heavens with a ferociousness not seen since the time of Noah. There was no official start. People just showed up around noon and began to run. I have seen many different kinds of running attire on marathoners, but what I saw today really defied description. Men were wearing the traditional Hasidic garb – long black jackets over long dark pants and women wearing long skirts and long sleeve shirts. I felt foolish running in traditional running shorts with a short sleeve shirt. However, I didn’t have religious running attire and I wasn’t going to start wearing it today. It took me at least 20 minutes into the run before I began to warm up. However, my hands remained cold and I had a feeling this would be the case throughout the run. The course was almost completely flooded and so was the lake. At about 3 miles into the run, I stepped into what appeared to be a shallow puddle. In actuality it was a small pot hole and the side of my left foot caught the edge of it, twisted my ankle nastily. I wondered if this was a reproach from g-d for doing such an event or if he was merely testing my resolve to complete such an endeavor. I made sure to avoid all future puddles. At about an hour of running I was still feeling pretty good. I had covered a little over 7 miles and I wasn’t feeling particularly hungry or thirsty, but I was completely drenched and my fingers started to wrinkle from all of the rain. The wind would alternatively be in front of me and then behind. I am not sure which I appreciated more. 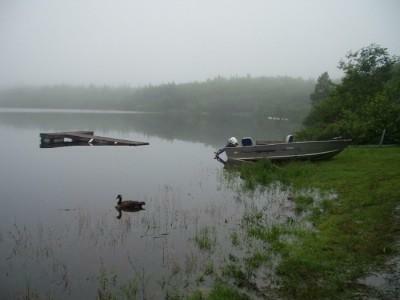 When it was behind me, I had a nice push to help me along, but my eyeglasses would fog up making it difficult to see. When it was in front of me, I had to fight against it, but at least I could see and the water on my face felt refreshing. As I started to pass the 90 minute mark, I began to develop the first twinges of thirst and hunger. It didn’t help that I forgot to turn off the 20 minute timer on my watch to remind me to take electrolytes and water. The constant 20 minute beeping began to become really annoying as I was repeatedly reminded that I was not allowed to take it any sort of nutrition. I refrained from letting any of the rain water slip into my mouth. I could only hope my body would absorb some water through osmosis. There was no pack of runners to speak of. Everyone was spread out I was surprised to see how fast that some of the participants could run, especially considering how heavy and wet their clothes must be by now. On the few occasions when I was running next to someone, I would usually be asked similar questions. Are you Jewish? Are you fasting? Were you at Shul this morning? I would answer these same questions repeatedly and I must have heard the words zay gezunt (stay well, good bye) or mazel tov (good luck) a dozen times. By now I was passing the ten mile mark and I felt a blister developing under my right big toe. My feet were completely water logged and my sneaker would make a hearty sloshing sound every time they hit the ground. There was only one Porta-San along the lake and you had to walk through some heavily muddy grass to get to it. I declined stopping at it for fear of having my sneaker sucked off in the mud. As I reached the 3 hour mark, I started to become delirious. I was incredibly thirsty and the rain made me think of the saying “water, water everywhere, but not a drop to drink”. I stopped looking at my watch, forgot about my distance and just concentrated on moving forward. At 3.5 hours I felt a warm liquid spread through my toes and realized that the blister forming on my foot had burst. This warmth reminded me of the times I pissed in my wetsuit and I decided to do so in my shorts to see if I could warmed my cold and cramping hamstrings. No one would ever be able to tell I took a piss in my pants as no one was really around and the rain water would wash it away in a few moments anyway. On one of my loops around the lake, I noticed several paramedics from the Hatzollah EMS squad hanging around the course. I was wondering if this even was a workout for them as much as it was for the fanatical participants of this soggy event. I saw another crew somewhere further along the course and they asked me if I was ok. I don’t think I registered that they asked me a question until I was about a quarter mile away from them. I was bordering delirium and hypothermia, but I insisted to myself that I was going to finish this marathon. One of the biggest mistakes I made during the day was to forget about checking my watch or distance. I was wearing my Polar S625x, so I could have kept track of my distance based on laps completed or distance ran. I had it set for Stopwatch and Lap Timer, but the information was meaningless as I stopped clicking off the laps. At 4 hours and 45 minutes I decided that perhaps it was time to look at it again. I was shocked to see the time and even more shocked that I was well on my way to completing my 8th lap. The distance reading stated 28 miles. I knew this was accurate, since I just synchronized it over Columbus Day weekend at the Red Hook running track in Brooklyn. There was nothing to do but to continue to the end of the lap. It was the closest way back to my car. Yes, I shouldn’t have been driving to the event, but I didn’t know anyone in Monsey (Monsoon) and frankly I no longer cared about anything. I was deliriously hungry and thirsty and needed to get out of the cold rain. I had brought with me a thermos of hot tea, which I hoped would still be warm. It was getting pretty dark by now and I didn’t care if the sun had not completely set. I needed to get something in my stomach and I needed to warm up quickly. I drank some tea and ate a Vegan Food Bar. I let my seat back and let my eyes close for a moment or two. When I opened them up again, an hour had passed and it was completely dark. I was stiff all over and my legs were agony to move. I didn’t know how I would drive home, but somehow I did. When I walked in my door, I was still wearing the clothes I had on for the marathon. They were cold and clammy and stuck to me like a second skin. I let them fall into a heap at my doorstep and walked naked into my bathroom. I filled the tub up with warm water and once again fell asleep while I let my body soak in it. Fortunately, neither the rain nor sleeping in the tub caused me to drown. Eventually pulled myself out and went to the kitchen to try to eat some more. I am not sure how I now feel about doing this event. It certainly was an accomplishment, but without any record of it, it is like it never happened. If a tree falls in the woods and no one is around to hear it, did it make a sound? I hope that doing this event wasn’t a sin in the eyes of the almighty. If it is, I guess I can rest in the knowledge that this story was written entirely before Yom Kippur began, so I am already forgiven for this sin.